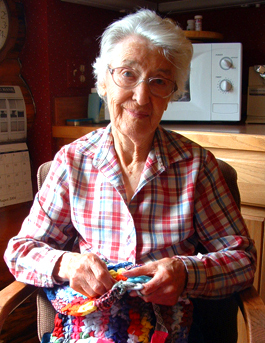 What Age Did You Start Crocheting? Have you ever gotten tired of the stereotype that only old ladies in rocking chairs crochet? Well, I am! Although I think most stereotypes have some truth behind it. Old ladies in rocking chairs do crochet, but I bet most of them learned when they were young. In my opinion, crocheting is a hobby that is timeless and once you learn it, it sticks with you for a long time. Maybe that is why lots of people think that it’s an old lady’s sport. I learned to crochet sometime in middle school. I’m not exactly sure what my age was, but I’m going to guess I was around 10 years old, give or take a year or 2. I don’t think a 10 year old is considered an old lady. Now, lets prove this stereotype wrong once and for all! What age did you start to crochet? This entry was posted on Tuesday, December 15th, 2009 at 3:44 PM by Rachel Choi	and is filed under Fun Ramblings. You can follow any responses to this entry through the RSS 2.0 feed. You can leave a response, or trackback from your own site. I started in my early 20’s – now (over ten years later) Im teaching my mom some pretty stitches and patters…. I learned when I was 8, I’m now 15 and I have started a book of the projects I have made and invented. I learned how to crochet a chain at a church activity on my 8th birthday, and I have been doing it ever since. Right after that activity, I crocheted a chain that stretched all the way from my bedroom out our front door, then two of my baby sitters showed me how to go up on rows and how to do a half- double crochet, then I took it from there except the occasional help from my mom. It was hard teaching me because I am a Lefty. Now I’m 14 and now teach occasional classes of 8-12 year-olds and the same church activity that I learned the chain at. CROCHET ROCKS!!! I started crocheting when I was about seven. I wasn’t that great but I’m thirteen now and have had plenty of time to improve and learn new stitches and teqniques. I was taught the basics around 8 or 9, then learnt more from books when I was 10. I love having a way to make stuff for my friends! My whole family crocheted for generations before me, and I’ve got boxes of items they crocheted over the years. I played around with it in my early twenties, but I quit back in 1977 when I had my second child. I just picked up my crochet hook when the last person who crocheted in my family died a few months ago. I realized that I’m the only one who knows how to crochet, so I’m hoping to teach a grandchild the art by making toys for Christimas. My adult children didn’t know I knew how to crochet that’s how long it’s been.